The Dark Faerie: Finding your place in the art world…. Finding your place in the art world…. I did graphic design for many, many years and though I was pretty good at it...it was not my passion. I longed to work with my hands, pencils, paint and so forth. Working on the computer 8 hours a day just felt too clean and too precise. I love getting messy in my studio…making mistakes…having happy accidents. What I just can't figure out now is what direction I need to go. I gave retail a shot by opening my own gift boutique/studio but the business aspect of that was so stressful that it drained my creativity and certainly left me a bit jaded. Now that the shop is closed and I am back in my home studio my creativity has blossomed once again. I am back to focusing on creating new illustrations, commissioned pieces and my running online shop. I guess what I can't seem to figure out is where to go from here. I always reflect on my life at the beginning of the New Year as I am sure most people do. Everyone has resolutions that they want to stick to, new diets and exercise routines and so forth. We all strive to be the best we can be during our short time on this planet…I just want to know that I am doing the most I can with the life I have been given. Where do I go from here? 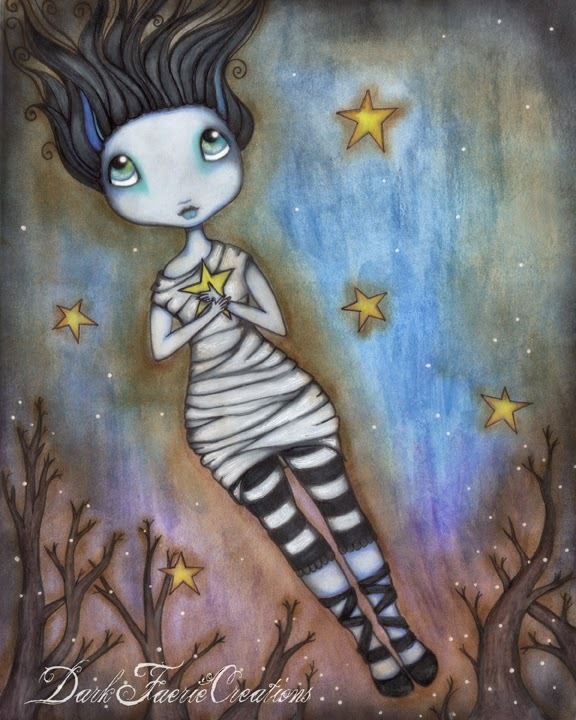 "Mummy Girl get's her wish"
I don't know what you do next... but I can tell you that you are not alone in the wondering. Carry on creating, try to enjoy each day, and see what unfolds? Nicely written; you express your feelings very well, as I would expect from someone so creative. You will find your path, of this you can be sure. Beautiful faerie. I found your blog through page 3 in my Artful Blogging magazine. I love finding interesting new blogs...gorgeous artwork.